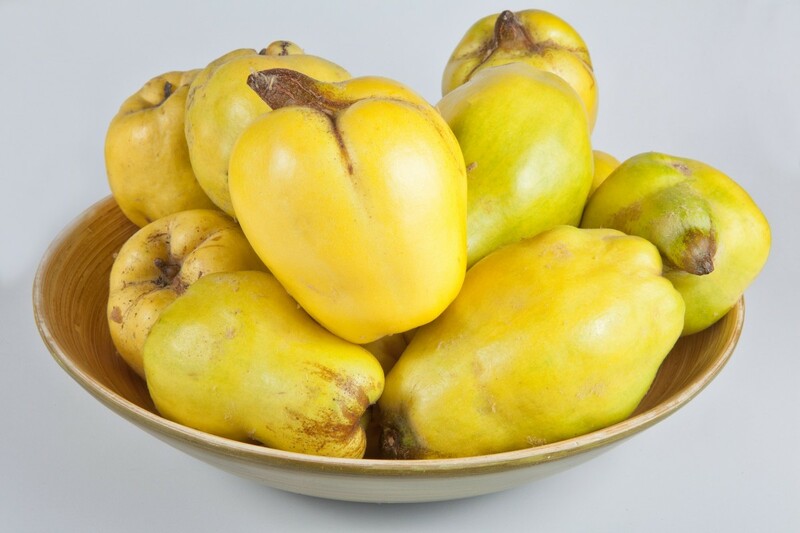 Quinces are aromatic yellow fruits that taste lovely when cooked. 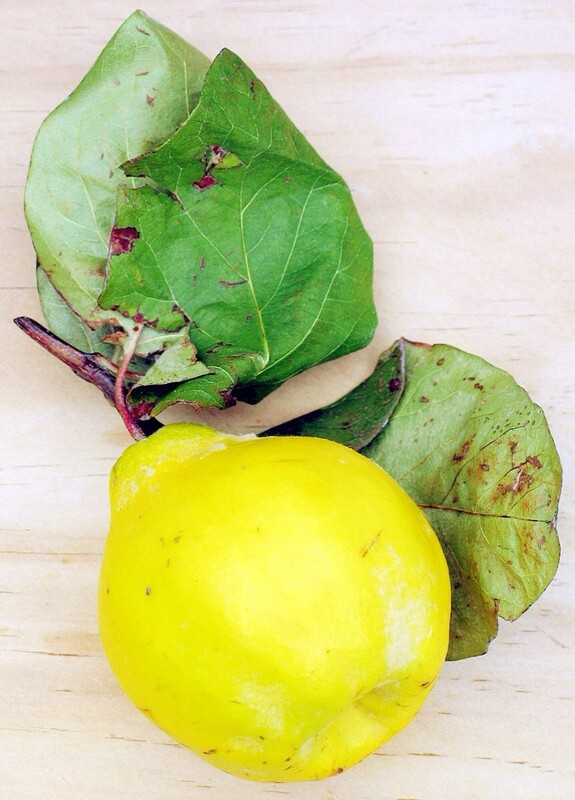 A raw quince tastes sour and astringent and has a white or pale yellow flesh. When the fruit is cooked for a long time, however, a seemingly magical transformation occurs. The flesh turns into an attractive orange or red color and the fruit develops a very appealing flavor. Quince fruits are high in pectin, the chemical that enables both quinces and citrus fruits to gel when they're cooked. They are used to make jams, jellies, and sweet pastes such as membrillo. They are also baked, poached, and stewed. Cooked slices are added to sweet dishes as well as to cheeses and meats. The fruit is sometimes used to make wine, cider, gin, or liqueurs. The cooked fruit is a versatile and enjoyable addition to the diet. 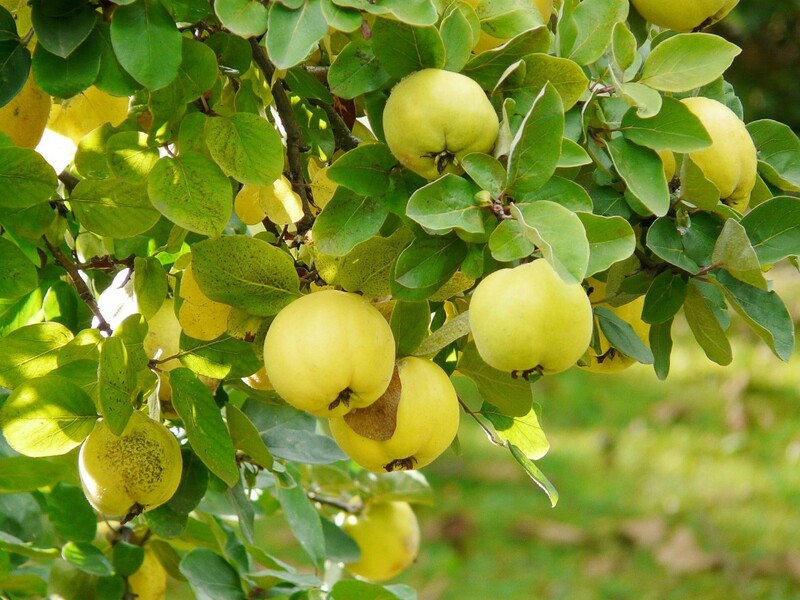 Quince trees are very popular in some parts of the world today. They were once a common sight in North American orchards. Individual homeowners often had a quince tree growing in their garden. The fruits look like a cross between an apple and a pear, which belong to the same biological family as the quince. The plants have the scientific name Cydonia oblonga. 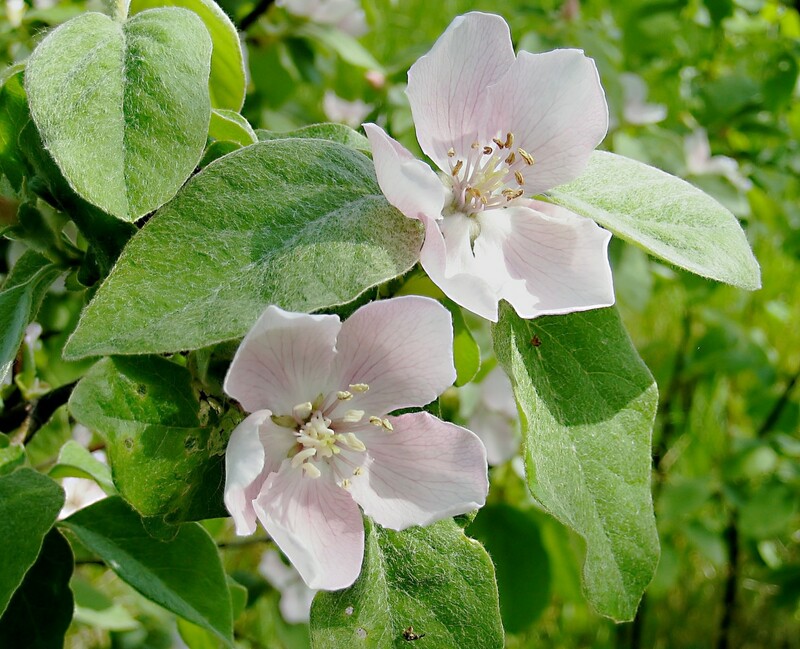 The quince tree is an ancient plant and likely arose in Asia Minor. It was in common use in Ancient Greece and Rome. It's been suggested that the fruit that tempted Eve was actually a quince instead of an apple. The golden apple given by Paris to Aphrodite, the Grecian goddess of love, may have been a quince as well. The fruits were used to fill homes with a fragrant scent (and still are) and were often considered to be a symbol of love. The first marmalades were made from quinces instead of oranges or other citrus fruits as they are today. The name “marmalade” comes from the Portuguese word for quince, which is “marmelo”. Quince trees are highly branched and spread widely. Most reach a height of ten to fifteen feet, but some are a little shorter or taller. They sometimes grow as shrubs instead of trees. The trees bloom in April and May and have attractive white flowers that are tinged with pink. The flowers are self-pollinating, so only one tree is needed to produce fruit. Cross-pollination improves the fruiting ability of a tree, however. 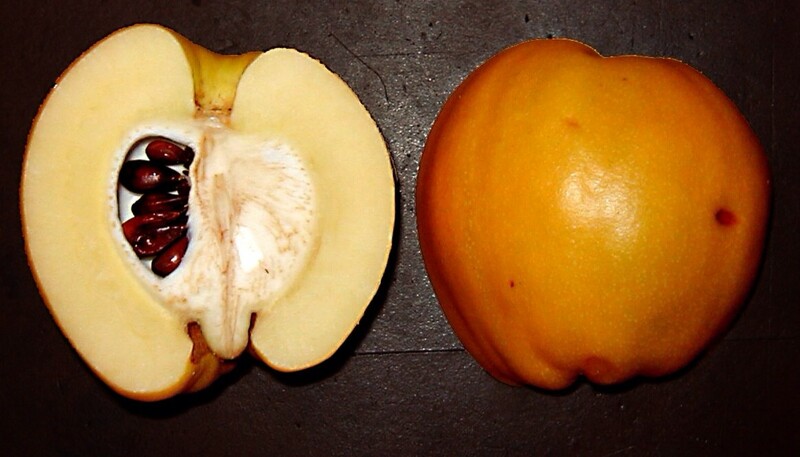 The fruits are green when unripe and become golden yellow when ripe. They are often pear-shaped but may be round. They sometimes have a lumpy appearance. The fruits are generally ready to pick in October or November. They are firm to touch at this stage and are also very aromatic. They will probably still have an astringent taste, except perhaps in the southernmost and warmest part of their range. Though raw fruits are safe to eat, they generally don't taste good until they're cooked. They can be stored in a cool area for a few weeks after being picked. Quince trees and flowering or ornamental quinces belong to the rose family (the Rosaceae) and are quite closely related to one another. Edible fruits from flowering quinces are sometimes used as substitutes for those from the trees, though some people think they are less flavorful. Flowering quinces are shrubs belonging to the genus Chaenomeles and are grown mainly as ornamental plants. They are valued for their beautiful red, orange, pink, or white flowers. One popular species is Chaenomeles japonica. The species name "japonica " is sometimes used as a common name for all flowering quinces. "Japanese quince" is another term that is sometimes used for all of the plants in the group. 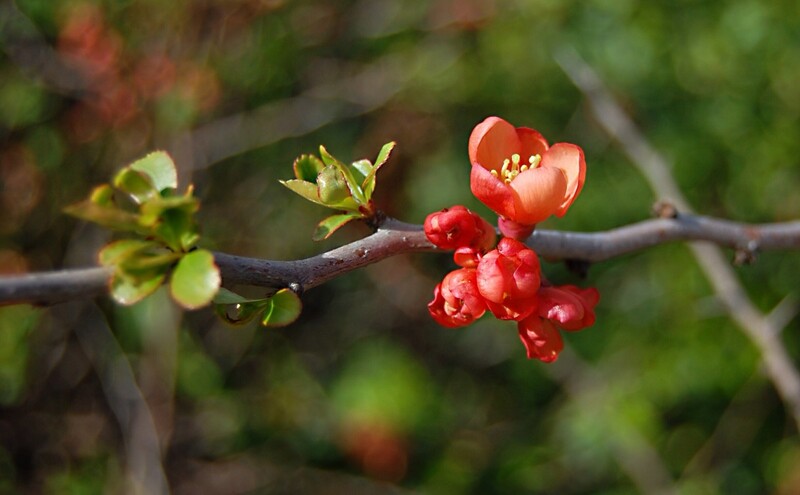 The fruits of a flowering quince are small and have a golden yellow color. 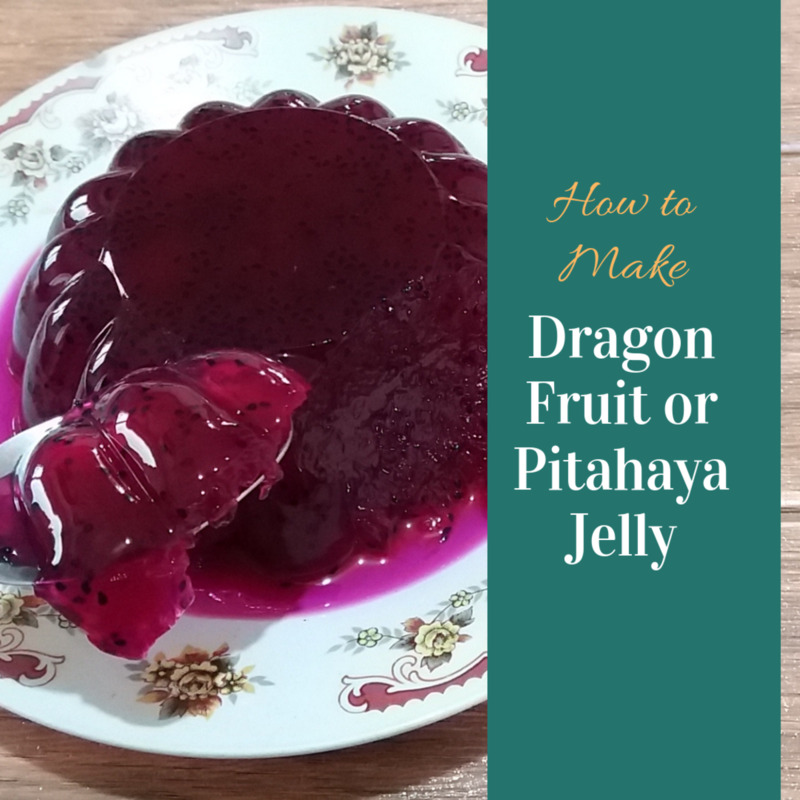 They are edible and can be used to make a jelly, like the larger fruit of their relatives. Some plants may not be ideal for harvesting because of the thorns on their stems, however. In others, the fruits may be too small to be of much use. To make a jam, quinces are first peeled, cored, and cut into pieces or coarsely grated. Some cooks prefer to leave the peel on the fruit. The peel may have a fuzzy coating, which can be removed with a wet cloth. The quince pieces are covered with water and boiled. Sugar is added to taste, usually after the quince has cooked for a while and has softened. Most recipes suggest between a 2:1 to 1:1 ratio of fruit chunks to sugar. Quince cores contain pectin. The cores can be placed in a muslin or cotton cheesecloth bag and then suspended in the boiling water to add extra pectin to a jam. Another way of adding extra pectin is to partially cook quince slices which still have their cores intact. When the slices have become soft but haven't disintegrated, the cores should be removed. 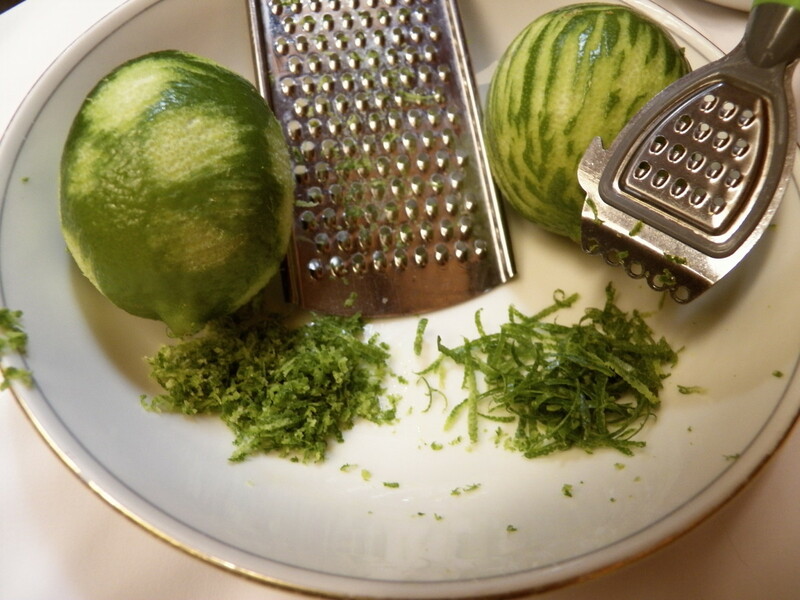 The slices should then chopped into smaller pieces and cooked until the jam is ready. A jelly can be made from water in which quinces have been boiled. One test that can be used to check whether a jam or jelly is ready to remove from the stove is to place a spoonful of the mixture on a very cold plate. If the mixture wrinkles and doesn't flow when it's touched, the jam is ready. Finished quince jam must be placed in sterilized jars and should be processed in a boiling water bath to ensure that bacteria and mold are destroyed. Quince seeds shouldn't be eaten. Although they don't seem to have been studied in detail, researchers say that they poisonous, especially if they are ingested in large amounts. They are believed to produce hydrogen cyanide in the body. Membrillo, sometimes known as dulce de membrillo, is a sweet quince paste. "Membrillo" is the Spanish word for quince. The paste is especially popular in parts of Europe and Central and South America. It's spread on bread, toast, crackers, and cheese and is used in pastries. Membrillo is made from a mixture of quince, sugar, and water that has been slowly cooked. 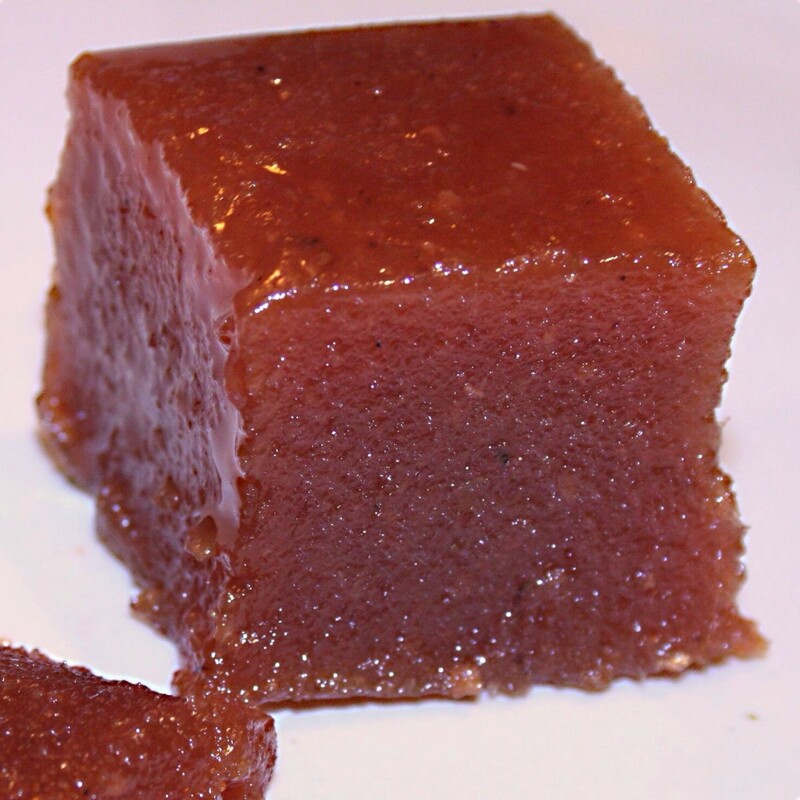 Although membrillo is referred to as a paste, it actually has a dense, jelly-like texture. It's sold as a block of gelled quince that maintains its shape. The block is sliced as needed. The slice softens as it's spread over food. In North America, membrillo is most likely to be found in ethnic or gourmet food stores. It may also be found in health food markets—especially those belonging to large chains—and in farmers markets. I have never stored membrillo, but it's said to stay fresh for at least three months when kept in a refrigerator. According to Harold McGee, a food science writer, the color of cooked quinces is produced by the conversion of chemical precursors into red pigments called anthocyanins during the cooking process. Anthocyanins are water soluble and color the fruit and the cooking water. McGee appears to be the only person who has investigated this topic. Membrillo is often paired with Manchego, a Spanish cheese made from the whole milk of Manchego sheep. These sheep traditionally live in the La Mancha region of Spain. They graze on plants growing on a high plateau that is located about 2,000 feet above sea level. Sheep's milk contains twice as much butterfat as the milk from most cows and goats. Manchego cheese has a rich but not overbearing taste and a unique flavor that is sometimes described as "nutty". The flavor becomes more intense as the cheese is aged. The cheese is classified as semi-soft (or semi-hard). Versions aged for a short time are softer than ones aged for longer. Local versions of the cheese are sometimes made from unpasteurized milk while exported ones are made from pasteurized milk. The inedible wax rind on the surface of true Manchego cheese has a distinctive zigzag pattern that resembles the weave of a basket. Originally this design was created by the grass press used to make the cheese, but now it's applied artificially. Like membrillo, Manchego cheese is generally available in specialty stores in North America instead of local grocery stores. Some markets temptingly display the cheese and membrillo next to each other. Quinces are rich in vitamin C, but some of this vitamin is lost when a quince is cooked. Unfortunately, most quinces are far too sour to eat in their raw form, although researchers are creating new, sweeter varieties that can be eaten when they are raw. The magic of cooking is generally required in order to change an unappetizing raw quince into a delectable food. Quinces provide fiber, especially if the peel is left on. They are low in fat and sodium and contain a significant amount of copper, potassium, and iron. They contain smaller amounts of other minerals and vitamins. Research indicates that they contain other beneficial chemicals as well, though more studies are needed to determine the quantities that are present. The fruits are low in calories, but the sugar that is sometimes added to them increases the calorie count. Different varieties of Cydonia oblonga exist. Their fruits may have different shapes. Some are round, some are pear-shaped, and some are lumpy. In North America and Europe, quinces are available in autumn in farmers markets, specialty produce stores, and occasionally supermarkets. Some people have quince trees or flowering quince bushes growing in their gardens and can harvest their own supply of fruits. Others may know someone who grows the plants but doesn't want to cook the fruits and is willing to donate the quinces from their garden. If a person doesn't want to make their own quince products or doesn't have time to cook the fruits, they can buy quince jam, jelly, and membrillo both in stores and online. Dried and sweetened fruit is also available. 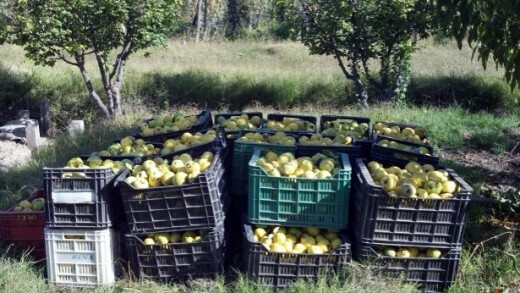 There seems to be a renewed interest in quinces in North America. They are definitely worth investigating. Their delightful aroma fills a room with scent and the lovely, sweet, and slightly tart flavor of the cooked fruit goes well with many foods. The availability of prepared products enables people to sample the taste. It may not be possible for many of us to pluck a quince fruit from a tree and immediately eat it, as we can do to an apple or a pear, but quince fans today are rediscovering what North Americans of the past knew well. It requires a bit of effort to coax a quince to produce its wonderful taste, but the effort is very worthwhile. Can I still eat Quince jam if the fruit doesn't turn red? You can eat it, but it may not taste very good. 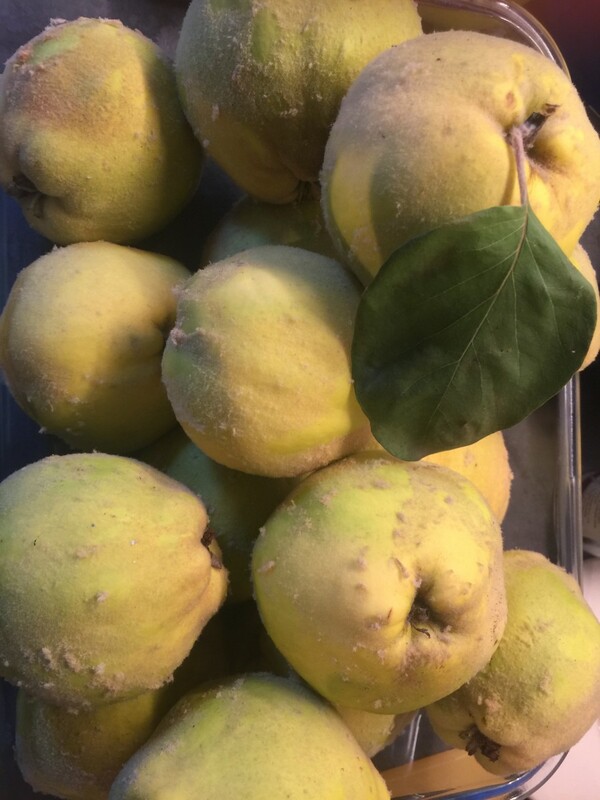 Quinces are safe to eat when they are raw, but most varieties are astringent and unpleasant to taste at this stage. Hi, boeregirl. Some factors that would help quince jelly set are adding more sugar as it boils , adding a small amount of lemon juice or, if necessary, adding commercial pectin. I have peeled and cored my quinces and they have been boiling for ages but it is still not jelly like....Help!! What have I done wrong? I enjoy quince jam too, Lynne! Thank you for commenting. Thank you for the comment and the vote, Eiddwen. It's worth trying quince at least once - you may discover that you love its taste! I have never tried quince but I will be giving it some serious thought now. thank you for sharing this one. Useful/up for this one. Hi, Danette. Quinces are sometimes hard to find, but they're a good fruit to experiment with if you do find them! Hmmm, never tried a quince but after reading this, I'll have to look for one in the store. Hi, Prasetio! Thank you very much for the vote. This is a new fruit for me. I had never knew about Quince Fruit before. 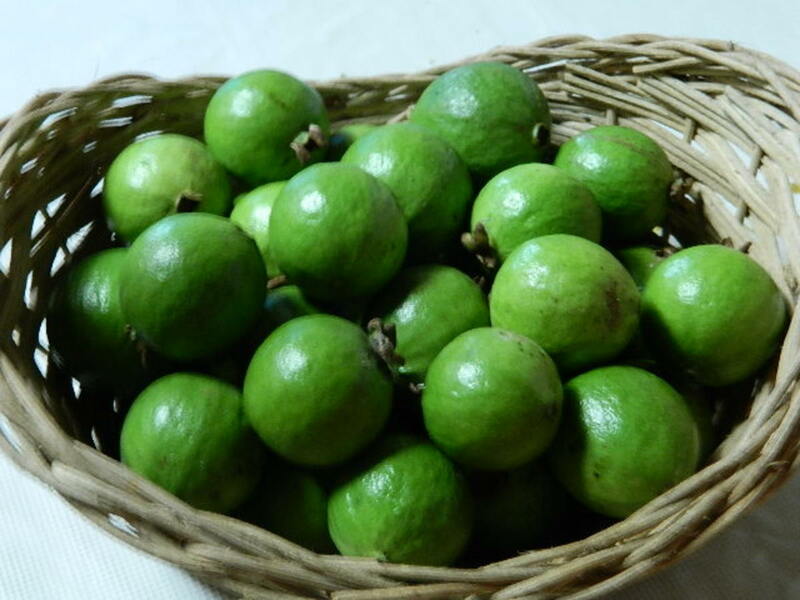 It's like a guava in my country. Thanks for share with us. I also enjoy the video above. Vote it up! Thank you for the visit and the comment, Sandyspider. Very interesting and sounds tasty. Good luck with your next batch of quince marmalade, Tina! Thank you very much for the comment. I tried to make marmalade from quince fruit but somehow I didn't do it right. I wish I had this hub before I throw away my last quince bush! Your hub makes the quince marmalade look and sound so tasty. I know my neighbor have some bushes and I will ask her if she can spare me some so I can try again! Thanks, this was very interesting! Thank you, kashmir56. I appreciate the comment and the vote. Quince jam tastes very nice! 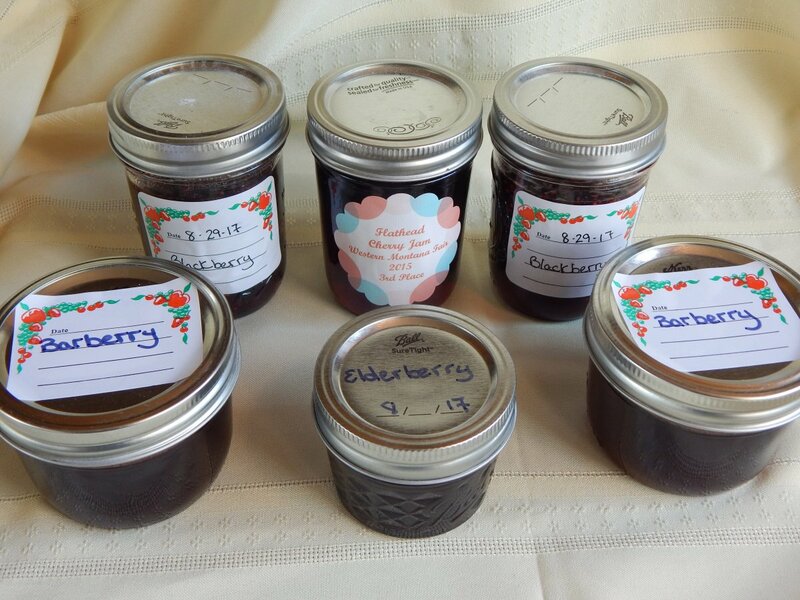 This delicious hub has made me hungry for some jam or marmalade, thanks for all the great info very interesting ! Thank you for the comment, CMHypno. I occasionally find quince jam in my local stores, although it's usually a jam made of quince and another fruit. Hopefully I'll find quinces in the markets in the autumn. We used to have Japanese quinces in our garden when I was a child. They had lovely flowers, but we never did anything with the fruit. What a waste! Hi, b. Malin. I think that quince is such an interesting fruit - it tastes horrible when it's raw and wonderful when it's cooked! I would like to try the types of quinces that taste good when they're raw, but I've never found them. Thank you for commenting. Well this was so Interesting and Educational Alicia. I learned a lot about Quince Fruit and it's many uses...Thank You. I've never made Jam or Jelly, but who knows I just might be tempted now...Mmmm. I also Enjoyed the Video.